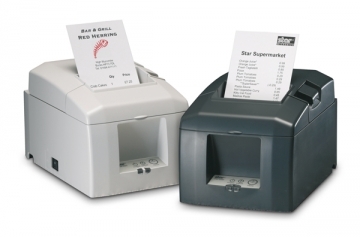 Star TSP650 is a high-performing entry-level thermal receipt printer. It has a top price/performance ratio, as well as many standard included features, making it a good choice for a multitude of applications in POS and production. It creates 58 or 80 mm wide bills and receipts at a speed of up to 150 mm per second, at 8 dots/mm 203 dpi, optionally in two colours. Changing the paper roll takes only seconds, plus its vertical placement kit included in the delivery further supports its ergonomic handling. Everything you need for immediate operation is included a wall mounting kit, paper guide for 58 mm wide material, power supply cover, and a thermal paper roll. Its auto-logo function guarantees a simple configuration of up to 15 different coupons and graphics, without adaptation to POS software. You can also order the TSP650 with a tear-off edge or integrated paper cutter. Also available are standard serial or parallel interfaces, as well as removable interfaces USB and Ethernet.